For the most part, Chip and I have put most of our yard work efforts in the backyard. We spend way more time out in the back so naturally that’s where we decided to focus our first few projects (getting grass put in, staining the fence, planting a garden). 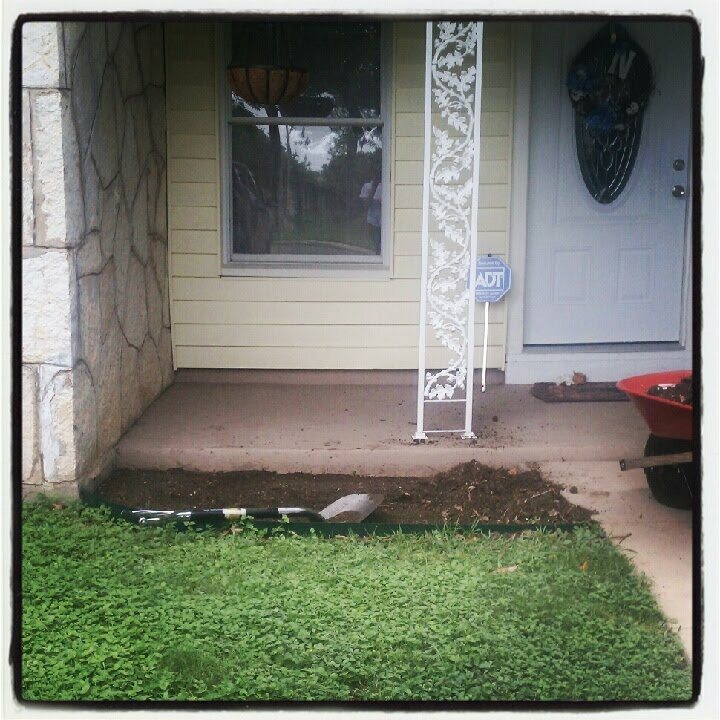 But we still talked a bit about the work we wanted done in the front yard and had only done one project there so far. We tried planting flowers once before around our big tree, but those have since died… we (mainly me…) didn’t do a good job keeping up with the weeds that had originally covered that area and within a couple of months, they had reclaimed that base for themselves. We have plans to pull those suckers out again and then cover that section with newspaper before laying down some nice mulch, but we haven’t made that little project a priority yet. 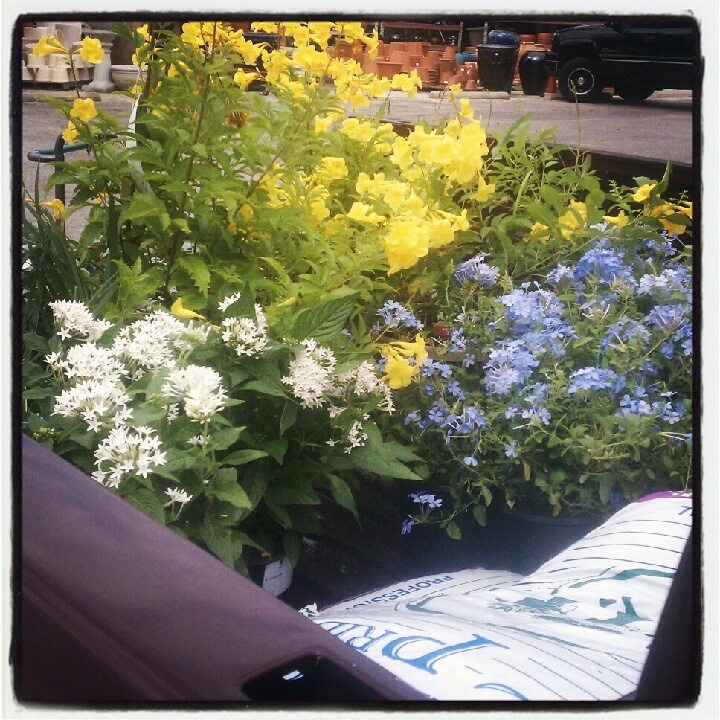 Instead, a lot of our conversations had turned to the actual flowerbeds we have in our front yard. We had cleaned out one side months ago and tried planting some blue plumbagos, but I accidentally loved them too much and overwatered those poor plants… oops. 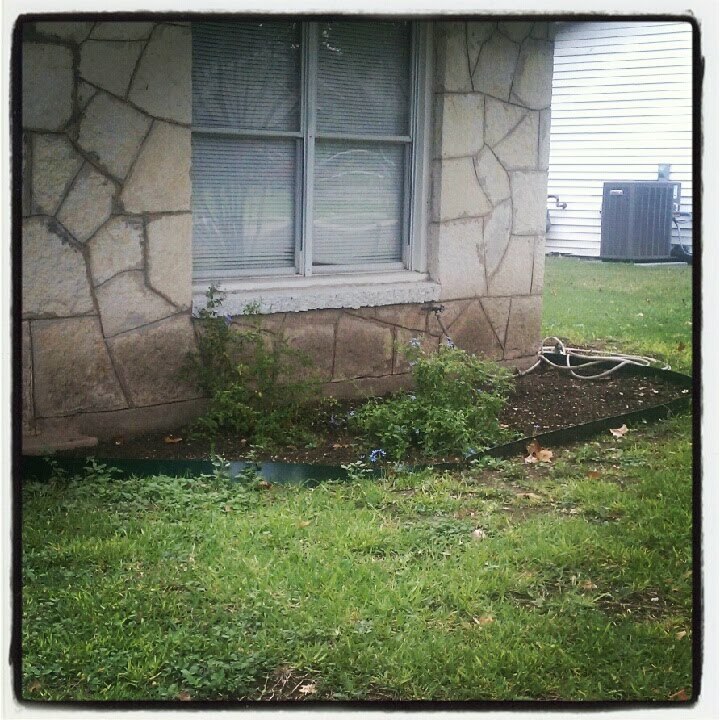 The other flower bed had two large green bushes that we just didn’t like at all and had no intentions to keep. 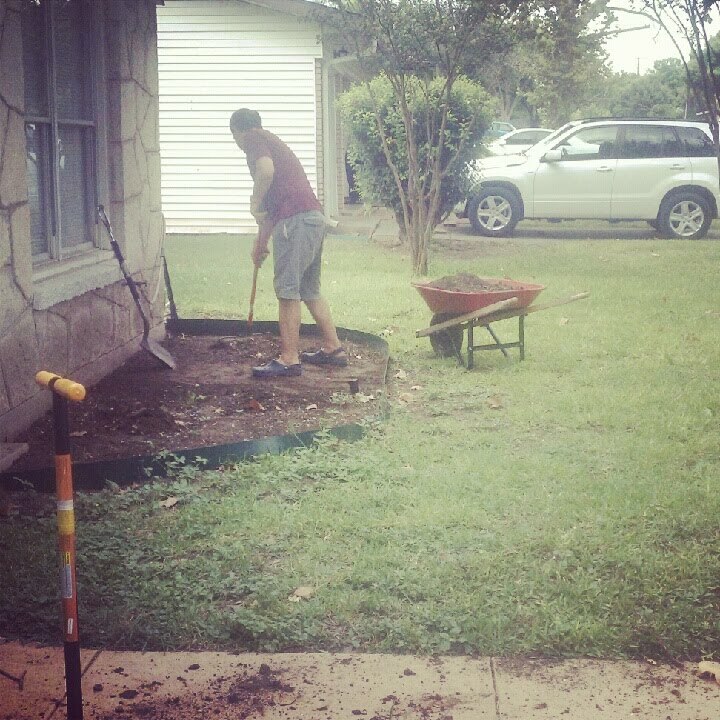 So over the course of a couple of weeks, Chip did some serious work digging out all those plants and starting to shovel out some of the bad clay dirt we get here in San Antonio. All of that early prep work made it much easier for us once we actually got started on these two flower beds over Labor Day weekend (thanks, Chip!). 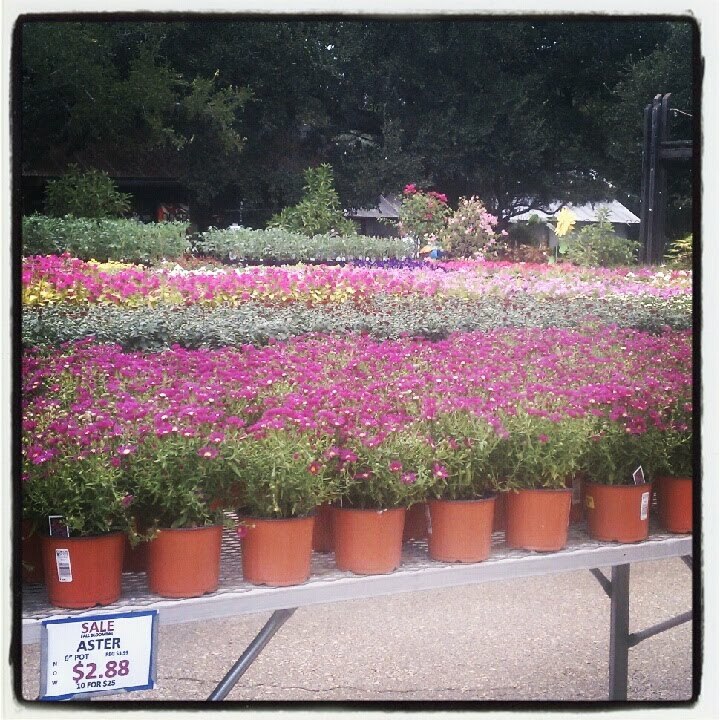 We both had a four day weekend from work for the Labor Day holiday, so we got that Friday off to an early start with a trip out to Milberger Nursery. If you live in San Antonio and haven’t been there yet, you really should go check it out. I was a little overwhelmed the first time we went there, but now really appreciate the huge variety of plants, flowers, grass, dirt/compost and anything else outdoor related that you can think of that they have there. We had a pretty good idea of some of the flowers we wanted, but we still walked around the entire property at Milberger just to make sure we knew what all our options were for some easy flowers. The staff there was really helpful and gave us some tips on what other plants we should include so we would have green in our front yard year-round. 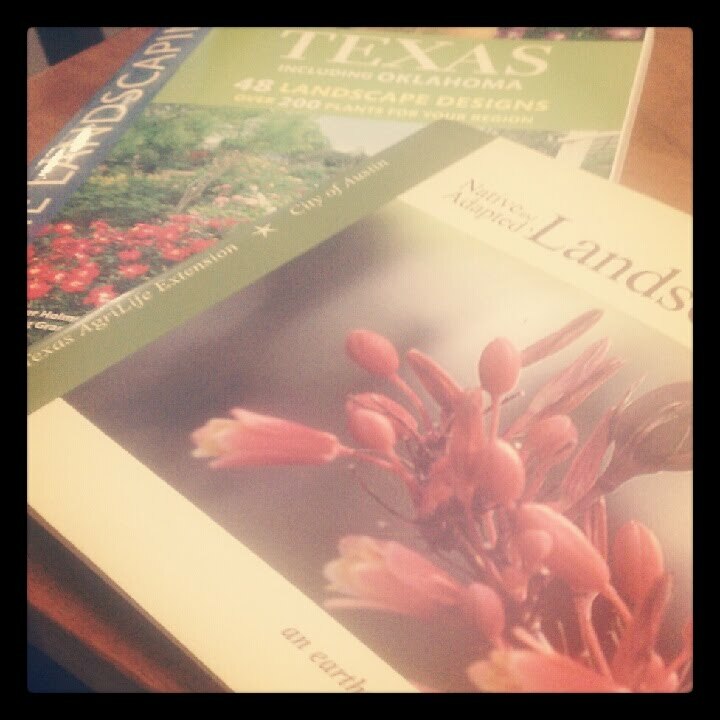 We also bought some Texas landscaping books that the ladies working the cash registar highly recommended (hey, I need all the help I can get!). 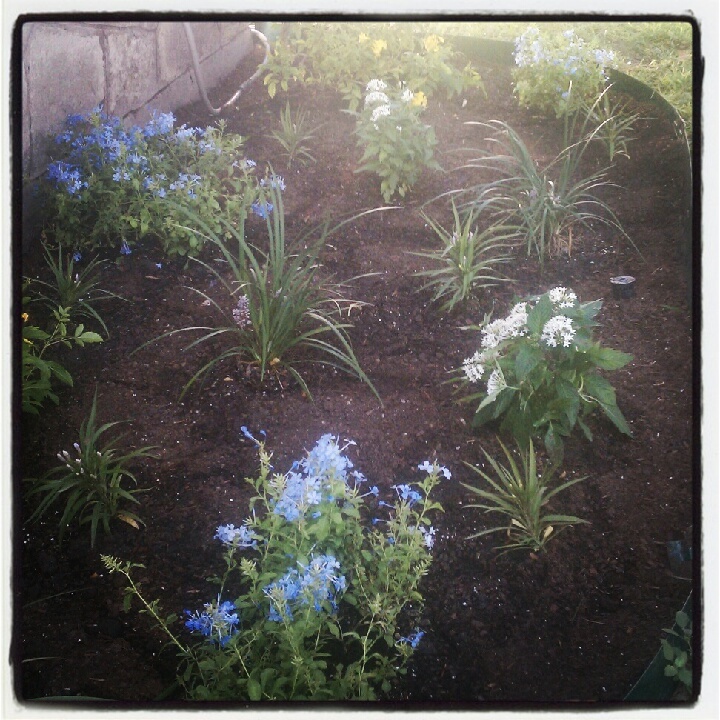 Here’s what the flower beds looked like when we got to work on Friday: not pretty. 1. Shovel out a good chunk of the clay and rocky dirt. We did several wheel barrel worths for each section and then brought in an organic topsoil/compost mix. 2. Rake out the new topsoil/compost mix to level out the area. 3. Space out the plants (probably my favorite step). 5. Water, water, water. We were advised by the staff at Milberger to give these plants a really good soak the day of planting and then wait a couple of days before watering again. These are supposed to be low-maintenance flowers, so hopefully we will only need to water 2-3 times a week. We were able to add mulch to the flower beds later at the end of Labor Day weekend and were really happy with how it all looked. They’ve lost some of their blooms since then, but I have faith that they’ll be fine (definitely getting enough water with all this rain!). We’re still hoping to add a nice stone border around these flower beds, so hopefully that will be one of our next projects! 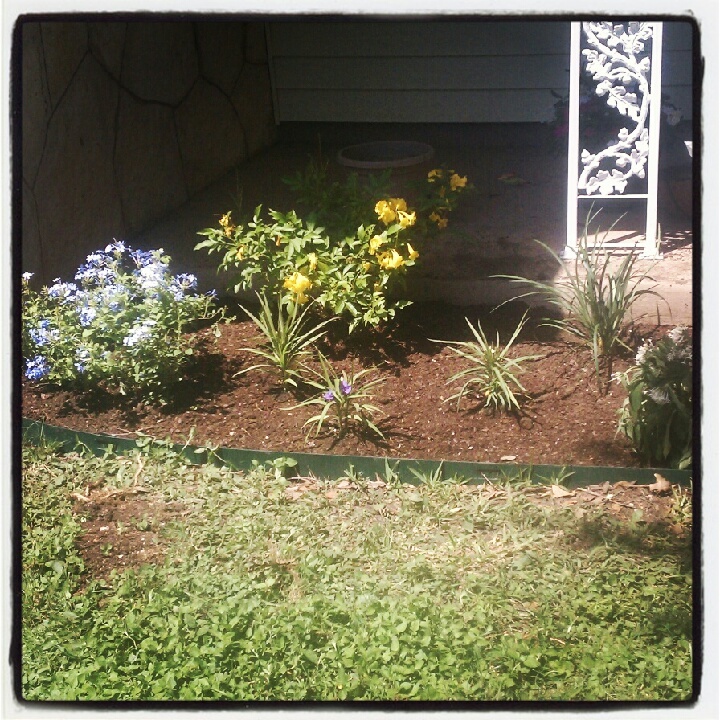 This entry was posted in House Projects and tagged flowers, yard work on September 16, 2012 by the nance familia. Yes, after just two weeks of fostering Target, he found himself a forever home. Once Chip and I spent a few hours with him after first bringing him home over Labor Day weekend, we knew that it wouldn’t take long for someone to fall in love with this sweet dog and adopt him. However, I don’t think either of us expected it to happen so soon! While we’ll miss his silly puppy energy and his happy wagging tail, we’re glad he found a home so fast and that his new family will get to know him at such a young and playful age. A family with two older kids adopted him and we couldn’t have asked for a better fit. With all these people at home, Target will be sure to get plenty of attention, something we wouldn’t always give him enough of. His new family also has another dog with tons of energy, so we’re sure Target will have nice long days filled with lots of wrestling and playing (no offense to Wrigs, but he just couldn’t keep up with Target!). We also enjoyed hearing how his new family loves music and will be changing Target’s name to Ziggy – we think it’s a great fit! Thanks, Target/Ziggy, for being such a silly dog and reminding us how fun (and at times slighty exhausting) puppy-hood can be! This entry was posted in Man's Best Friend and tagged dog, foster dog, rescue dog on September 16, 2012 by the nance familia. I saw this article on Mashable today and I have to say… it really made my day. It’s a collection of 17 priceless videos of people being surprised with a sweet gift of a puppy. Yes, I love dogs. But I also love how all of the people in these videos, young and old, react with the same unrestrained joy when they get a fuzzy little pup. Really, this is some of the most heartwarming stuff you could see today (the little girl in the 6th video is probably my favorite of the bunch, she’ll make you cry!). So take a minute to go through these videos, I promise it won’t be a waste of time. Puppies – Best Gifts in the World? 1. Go to a pet shelter to see what puppies they have waiting for a good home. Especially in cities like San Antonio where the spay/neuter rate is so low, you’re guaranteed to find a wide selection of pups. 2. Think carefully before getting someone a puppy as a gift (only do it if you’ve already talked about bring one home). Sadly, lots of dogs and cats get turned into shelters after the holidays from people who liked the idea of a pet as a gift, but didn’t actually want that lifestyle. 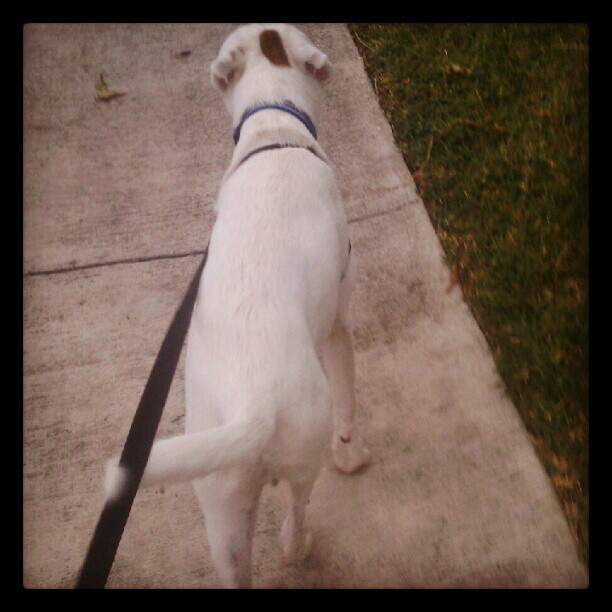 This entry was posted in Man's Best Friend and tagged dog on September 10, 2012 by the nance familia. As I mentioned in my last post, we recently found a home for Duke. Fostering Duke was more rewarding than we could have expected and we are so thankful that we live in a home that can support having a foster dog. We were excited to foster again, but we wanted to take a little bit of a break before bringing home another dog for a few reasons. 1. We would be going out of town for our trip to Colorado, so we didn’t want to bring a foster into our home for a week before heading out on vacation. 2. We wanted to get our house back in order. As much as we loved having Duke in our home and dog-sitting for different friends, having several dogs to take care of meant our house got put on the back-burner for a bit. We had a few small projects we wanted to focus on so we thought being a one-dog household again would help us out. 3. We wanted to give Wrigley some good one-on-one attention. He had adapted really well to having Duke around, but we wanted to see how he did without him and also spoil him a bit to make sure he was feeling loved. This meant that our best buddy was now allowed to get on the couch with us if we had a blanket for him to lay on as well as receiving a few more table scraps. 4. 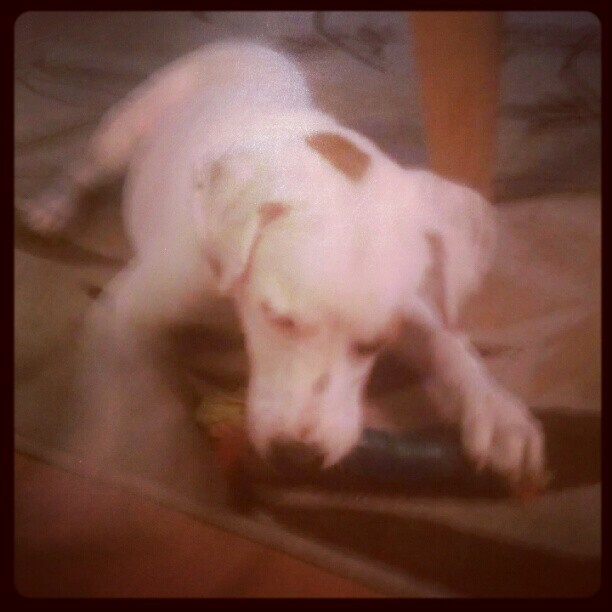 We needed time to prepare ourselves… let’s be real, we will never have a foster as sweet as Duke! After a few weeks with just Wrigley in the house, I got an email from Peggy, the founder of CARE, which is the organization we had fostered Duke through. 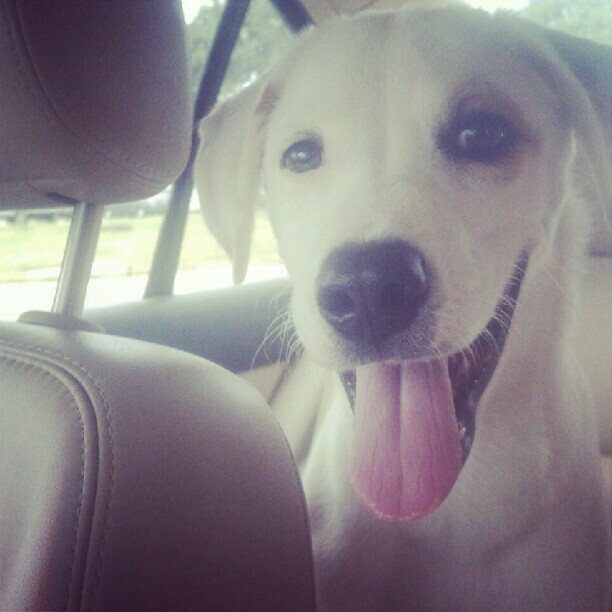 She emailed me about this sweet little pup named Target. Similar to Duke, he was at ACS and was scheduled to be put down since all of the shelters in San Antonio are over capacity. One of the staffworkers at ACS contacted Peggy and asked her for help; she had become attached to little Target in a very short time and couldn’t stand to see him not have a chance to find a way home. So Peggy went to ACS and pulled Target out, without a foster or adopting family lined up. This was two weeks ago. Peggy had been paying for Target to be boarded at different places just to keep him alive. So after talking to Chip, we agreed that Target would be our next foster. It was a little sooner than we thought we would be bringing another dog home, but we couldn’t pass up helping up this guy! 1. He’s extremely curious and unafraid. Maybe it’s because he’s so young, but Target doesn’t seem to have any fear at all. Whereas Duke definitely had a past and would be startled at any noise, Target has to find out what’s going on whenever he hears a new noise. I love that he still has this innocence and that this will make his transition into his forever home easier. 2. He doesn’t like to be alone. I’m not sure if it’s because he had been boarded for the last two weeks and might not have had much interaction with people, but he loves to follow us around wherever we go in the house. We did a lot of yardwork and housework this past weekend with the Labor Day holiday, and Target was always there with us, inspecting our progress on our projects and laying down in whatever room we were working in. He also loves to cuddle and gets so excited to see us whenever we get home. It hasn’t taken him much time at all to look forward to seeing us and jumping in our laps for a belly rub. We really hope we can find a home for Target soon. 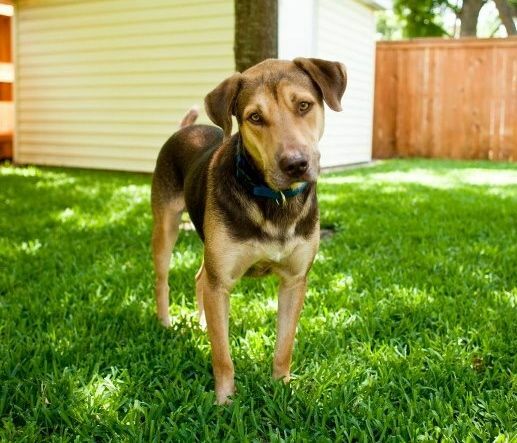 He’s such a silly, sweet dog and we would love for his new family to see his fun puppy side. He’s doing really well with his crate training and is even starting to go outside on his own through our little doggy door whenever nature calls (pretty impressive for only being here 72 hours!). We can’t wait to find Target his forever home! Doing a great job on his first walk! This entry was posted in Man's Best Friend and tagged dog, foster dog, rescue dog on September 3, 2012 by the nance familia. This post is a bit delayed, but still special to me. For those of you who haven’t heard yet, Duke has found his forever home. Hooray! Ever since Chip and I first brought Duke home six months ago, my co-worker Sandra had her eye (and her heart!) on him. She had been wanting a dog pretty badly, but didn’t think she should be getting one in her current home since their yard was a bit small. But that didn’t stop her from consistently asking how Duke was doing and if he had found a family yet. Well, an opportunity came up over the summer that would allow Sandra to have Duke. She would be moving into a larger home with her family, one that came with a very large yard with plenty of space for a goofy dog to run around and play. After a bit of talking and planning, it was set. She would be adopting Duke. Duke is such a great fit for her with his easy going, gentle personality. I dropped Duke off over at her house a few weeks ago and it was so great to see him familiarize himself with his new home, sniffing out the living room and exploring the backyard. By the time I left Sandra’s house that afternoon, I knew Duke would be loved in his new home and that he would do a great job being a companion and protector to Sandra and her family. I do have to admit, it was a little hard saying good bye to Duke. Knowing that we would be giving him to Sandra to adopt, I had prepared myself the week before hand, spending lots of time cuddling with Duke and telling him what a great foster dog he had been (yes, I’m one of those people that talks to dogs and believe in some way they know what you’re saying). I did my share of crying early hoping it would help me be less of a mess when I would give him to Sandra. For the most part, I was fine. I really didn’t get choked up or anything until I was leaving Sandra’s house. As I was walking out of her house, Duke started to follow me and as I stepped outside he just looked at me and did his cute little head tilt in confusion. It was so adorable and so Duke. I made myself walk quickly to my car and drove home crying, feeling so grateful that we got to spend six months with such a sweet dog. I did a little more crying at home and shamefully finished off a pint of Blue Bell chocolate chip cookie dough (could I be any more of a girl?). 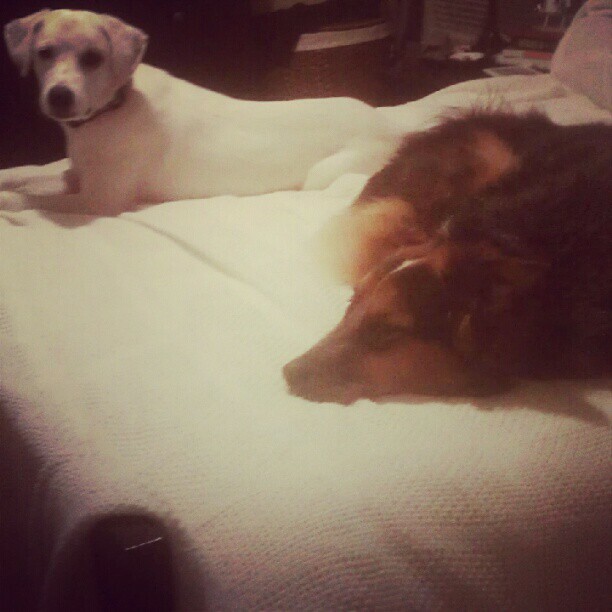 But by the end of that day, I was at peace being back to a one-dog household and excited for him and Sandra. It’s been great hearing stories from Sandra about Duke. He’s still adjusting a bit, but considering how timid he was at first, I’m not surprised at all that he’s taking things slow. I’m so thankful for how Sandra has been patient with him and having him learn to trust her. I have a feeling these two are going to be quite the dynamic duo and I can’t wait to hear more stories about Duke from Sandra. We are so thankful for the time we had with Duke. We fostered him for six months, which was much longer than we had expected. But for him, that amount of time was necessary. 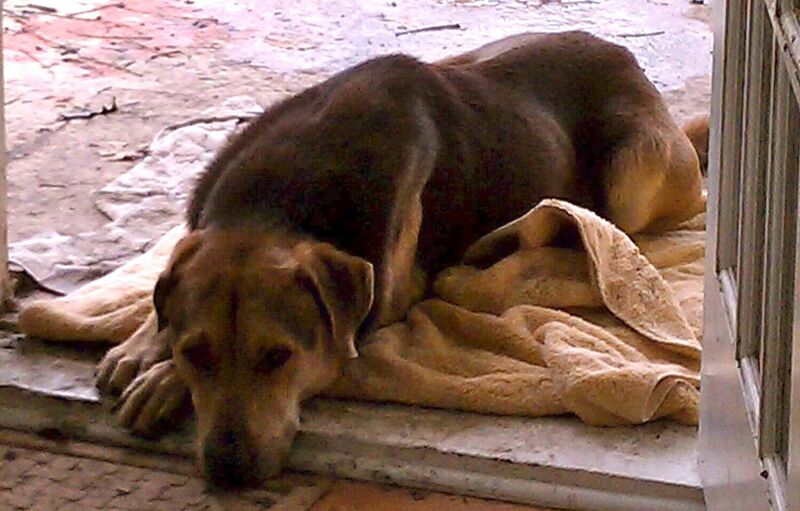 He was such a timid, scared and bone-thin dog back in February. 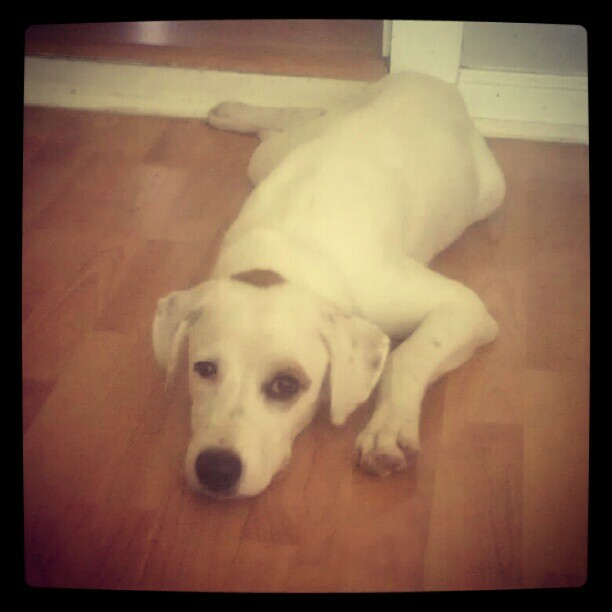 But now, he’s a beautiful dog with a silly personality and enjoying his own home. As Chip and I sat talking about how we would miss silly Duke we couldn’t help but joke that we started off with a perfect foster dog and how it would probably ruin our expectations for every other foster dog we have. Duke, you sure have set the bar high! Thanks to care for finding Duke six months ago at ACS and asking us to take him in so he would be saved from being put down. And thanks to everyone who supported us in our first foster dog experience! Duke ready for his new home! 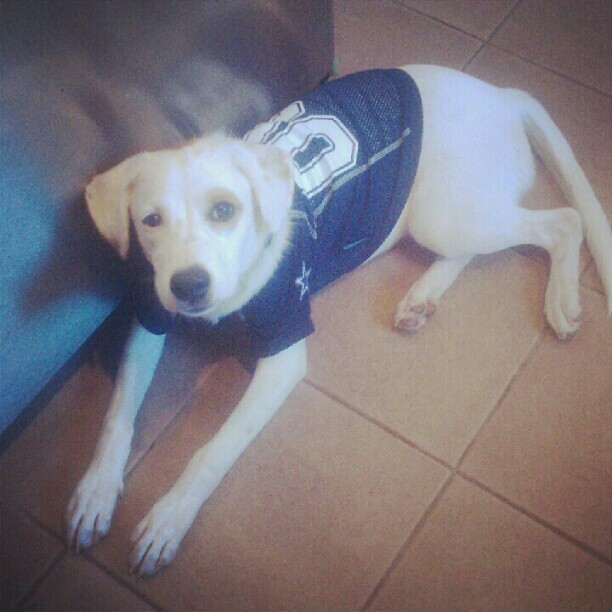 This entry was posted in Man's Best Friend and tagged dog, foster dog, rescue dog on September 1, 2012 by the nance familia.